THIS IS THE MOST COMFORTABLE HARNESS I’VE EVER WORN! I just purchased a new Diamondback harness and while I haven’t hunted with it yet I have worn it while hanging stands and it was awesome! The padded straps combined with the light weight make it very comfortable to wear and the buckles make it very easy to get on and off. The tether is a nice length as well as I had plenty of room to move while setting my stands while still being secure. Over the years I have owned 3 or 4 safety harnesses, and each one with time and engineering keeps evolving and improving. The ambush is the best yet. Light weight, comfortable, and easy on/off. I feel very unincumbered in this harness. Can’t wait to actually hunt in it. BEST SAFTETY HARNESS HANDS DOWN! I could not be happier with the safeguard safety harness. It’s smooth and easy to take on and off, very lightweight and has the ability to tie and hook on many other pieces of equipment and keep them in a place where it’s easy to reach. While remaining hands free when it’s time to shoot. A NEW lightweight, no bulk, 1.9 lb. 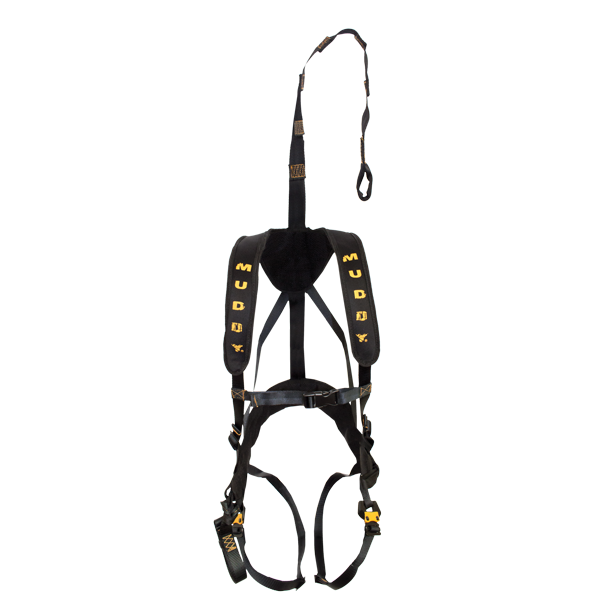 harness, this harness combines padded waist and shoulder straps with adjustable leg straps and quick release leg buckles. Flexible, anti-shock, bungee tether strap allows 360° mobility in the stand. Quick-release buckles and a quick-set, one-hand carbiner clip along with adjustable straps make it easy to put on. Padded waist and leg straps reduce chafing. Silencer sleeves keep game-spooking noises to a minimum. Flexible anti-shock bungee tether lets you get into position freely for difficult shots. If you are looking for a cross between a minimal safety harness like the Muddy Safeguard and a vest style harness like the Top Flight Combo, the Muddy Crossover harness is a perfect fit you. The Muddy Crossover offers plenty of freedom for movement in the tree stand, but also provides pockets to store gear critical to your hunt. This lightweight, padded nylon safety harness features quiet, quick-release, cam leg buckles, as well as cinching, easy-adjust straps through the torso for a secure and easy-wearing fit. Padded straps around the waist and shoulders ensure comfortable hunting all day long. The Muddy Safeguard hunting safety harness is by far our most popular harness. Its simple yet advanced design has a minimalistic approach. The harness provides comfort and safety without restricting a hunter’s movements while in a tree stand. The safeguard is available for men, women, and youth hunters. Super Light! Sized to Fit, no Extra Bulk Provides SUPREME COMFORT! 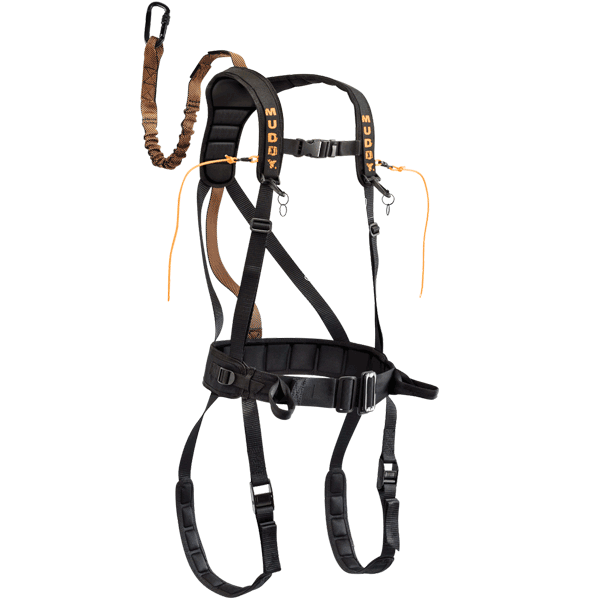 The Top Flight Combo safety harness is the most functional harness in our line. It provides you with the secure feeling of a vest style harness, offering both binocular straps and 8 pockets to store gear in. If you are looking for a harness that can provide quick and easy access to essential items during the hunt, look no further than the Top Flight Combo harness. The Safe-Line Features A Unique System that Allows the User to Stay Attached to the Tree at all Times! Two Prusik Knots; Slides Easily Up and Down the Rope During Ascent and Decent and Stops You IMMEDIATELY! The Muddy Outdoors product line would not be complete if it was not for the comprehensive line of hunting safety harnesses. 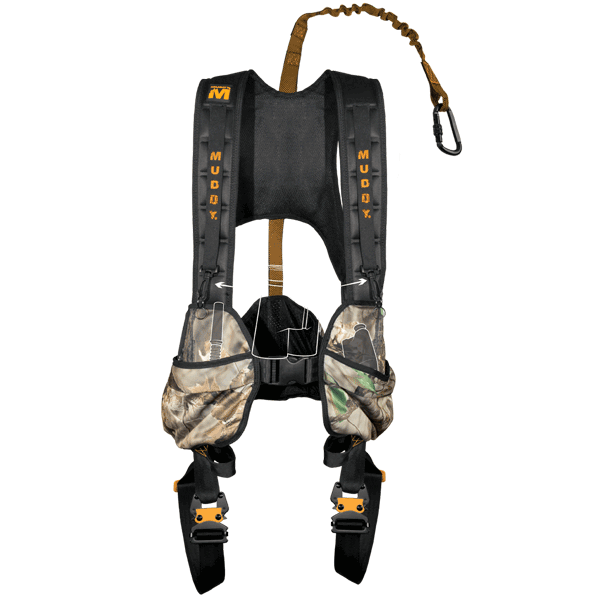 These tree stand safety harnesses offer industry-leading comfort, function, and above all safety while in the stand. 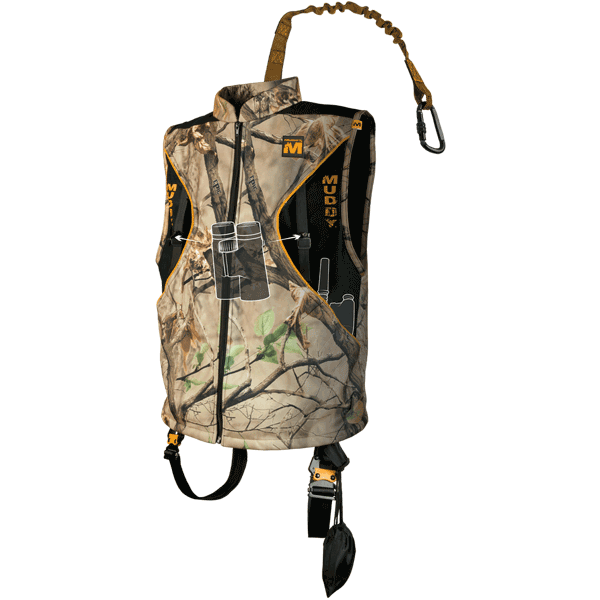 The safety harness line offers hunting harnesses for men, women, and youth hunters. They also come in a variety of sizes to fit the weight and height of a hunter. Check out the full line of safety harnesses below! Don’t forget to pair your safety harness with our lineman’s rope, safe-line, safety harness tree strap, and carabiner to stay connected to the tree during every moment of the hunt.